Ka‘ena Point: The dry, windswept coastal dunes of Ka‘ena are found at the westernmost point of O‘ahu. Situated at the base of the Wai‘anae Mountains, the reserve protects coastal dry shrublands and rare coastal plants. It is also a nesting area for the Laysan albatross and is regularly visited by Hawaiian monk seals. Humpback whales and several species of seabirds can often be spotted offshore from this reserve. 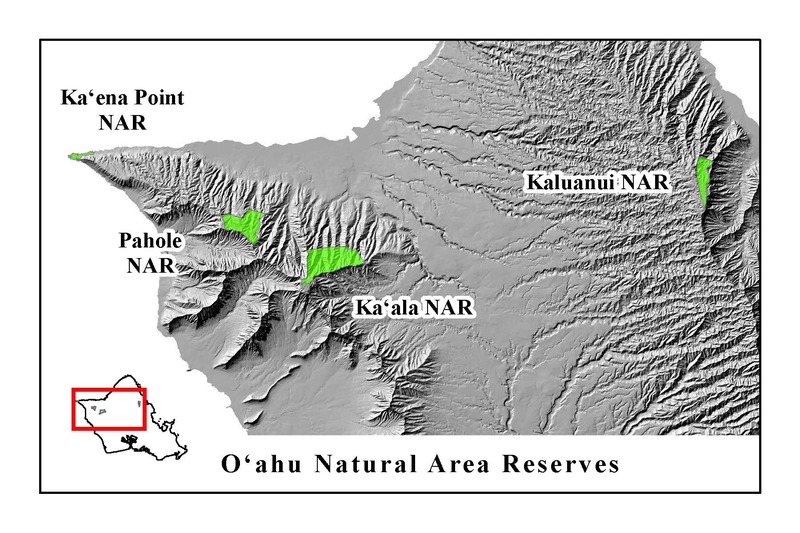 Kaluanui: Located on the windward side of O‘ahu, Kaluanui is the first NAR to be established in the Ko‘olau Mountains. Kaluanui preserves unique lowland forests and the Kaluanui Stream, one of the few streams on O‘ahu unaltered by humans and prime habitat for all five of Hawai‘i’s native freshwater fish species. The lowland wet forests and wet cliffs are home to 29 endangered or rare species. 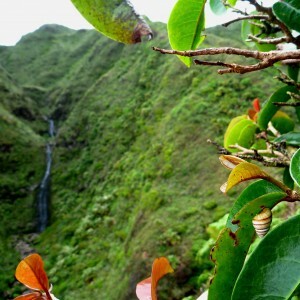 Kaluanui is bounded at its lower elevation by a series of large waterfalls. Mount Ka‘ala: Ka‘ala is the highest point on the island of O‘ahu (4,020 ft.) and is found in the northern section of the Wai‘anae Mountain Range. The fog-shrouded reserve features steep, wet slopes that descend from a montane bog to semi-wet foothills. 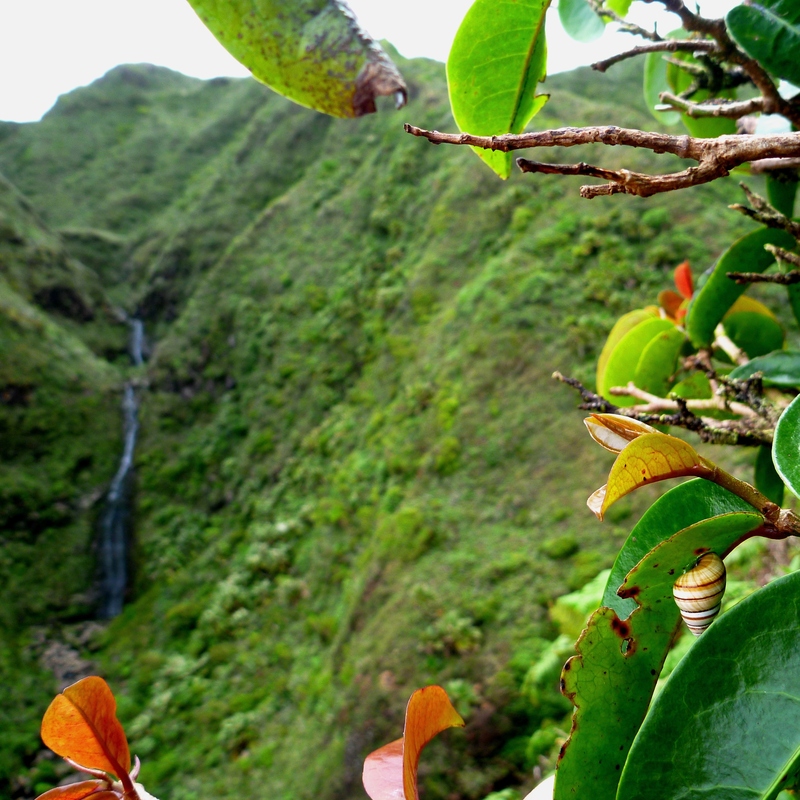 This reserve contains some of the rarest plants in Hawai‘i. Pahole: This reserve encompasses a complex valley system in the northern Wai‘anae Mountains. The area is known for its natural diversity and extends from the summit ridge down to the dry lowlands. The reserve contains a rare dry forest, a rare mesic forest, endangered Hawaiian tree snails, lowland mesic forests, dry shrublands, as well as a Hawaiian intermittent stream community.